Rotomite 180P dredges toxic waste from a Venezuelan aluminum plant. SRS Crisafulli. SRS Crisafulli, Inc., founded in 1966, is one of a select few manufacturers of specialized, engineered dredging systems in the United States. The company is now, and has been since its inception, located in Glendive, MT. From its beginning, SRS Crisafulli has served agriculture with pumping equipment for irrigation, flood control and dewatering. The past decade has been a period of carefully planned, controlled growth for this Montana company, as it moved into industrial markets for liquid waste handling. The Company shipped its first order to the South American continent in 1996. 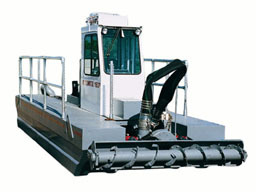 Valued at approximately $400,000, the dredging system comprised the Crisafulli Rotomite 180-P self-propelled dredge, floating discharge line, a trailer-mounted booster pump, and accessories, as well as spare parts for a 2-year period. In December 1996, Crisafulli engineers followed the dredge to Matanzas, Venezuela where it was installed in a toxic waste pond containing red mud from an aluminum production facility. The purchaser requested that Crisafulli work diligently for the earliest possible delivery so that hazardous wastes could be removed from holding ponds before wastes overflowed into a nearby river. Crisafulli's manufacturing team responded by working many evenings and weekends to avert what the client called a potential environmental catastrophe. The Crisafulli dredge system is unique, custom-engineered, and Made in Montana - to solve urgent problems associated with hazardous waste remediation - around the world.